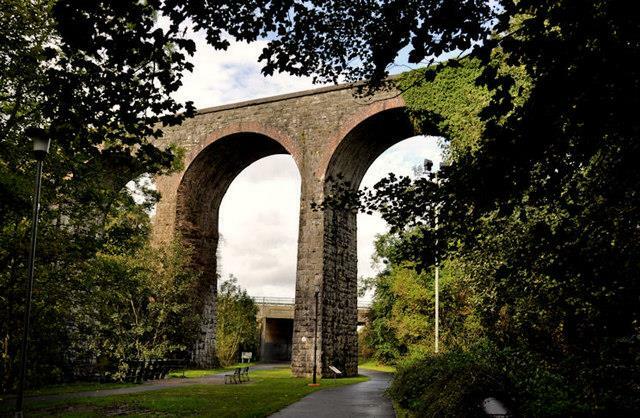 Start at the Railway Viaduct in Dromore Park. From the Viaduct follow path to footbridge, cross and follow riverside walk to Regents Bridge. Turn left to pass Dromore Cathedral church and restored High Cross. At mini roundabout take right to Market Square. Pass the Market House and the Stocks take the road on the right, Mount Street, Leading to Dromore Mound. Visit the Mound and turn right into road taking right at the junction. Take the next road on the right Caugheys Road, crossing the river and pass Flax scutching mill. At junction with Parkrow Road turn right. Continue to the junction with Dromora road and take right following the road to its junction and take left. Past the church take road on right Drumbroneth Road. Continue along this road looking out for a footpath sign on the right. Take this public footpath to the Barban Hill Road. At Barban Hill take a right and follow the hill down towards the town. Take the first road on the left past the ruins of Dromore Castle and then take a left to re-join the Banbridge Road. Continue along this road to park and starting point.